Growing habit near Epupa Falls, Namibia 2017. Origin and Habitat: South western Africa, especially in Namibia and Angola. It also occurs disjunctively near Nokanneg in Botswana. Altitudinal range: 1000-1600 metres above sea level. Habitat and ecology: Pachypodium lealii grows in semi-desert areas and arid low mopane scrub and xerophyllous forest, usually on rocky hillsides. It is especially common in the Etendeka plateau of NE Namibia, where it can be seen growing in the basalt slopes. The extreme temperatures range from an occasional -10°C to as much to 45°C. In winter some snow may fall. 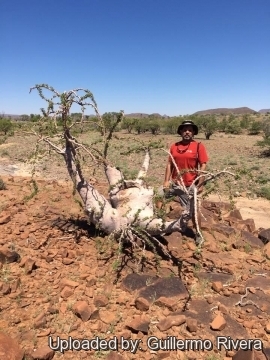 Pachypodium lealii doesn't appear to be under significant threat, but the lack of young specimens, and the removal of wild plants for trade, is a concern in Namibia. It is listed on Appendix II of CITES, which makes it an offence to trade these plants internationally without a permit. 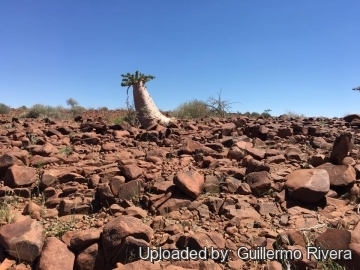 Description: The Bottle tree, Pachypodium lealii also know as Pachypodium giganteum, is one of the largest bottle-shaped species in the entire genus. It is a very eye-catching shrub or tall tree-like, succulent (pachycaul) 3 to 6(-8) metres in height with a broad bulbous base from which multiple trunks sprouts. The trunk and branches are metallic grey or brownish, thick and succulent. It strongly resemble cereiform cacti, with highly succulent, cylindrical stems armed with tubercles, each having sharp spines. Like other pachypodiums, this succulent stem of the plant acts as a water store that enables it to tolerate the hot, dry environments in which it grows. At flowering time, the leaves drop off, and long, pointed buds at the ends of the leafless branches open into attractive, sweet-smelling, white flowers, flushed with purple on the undersides. Its sap is highly toxic. 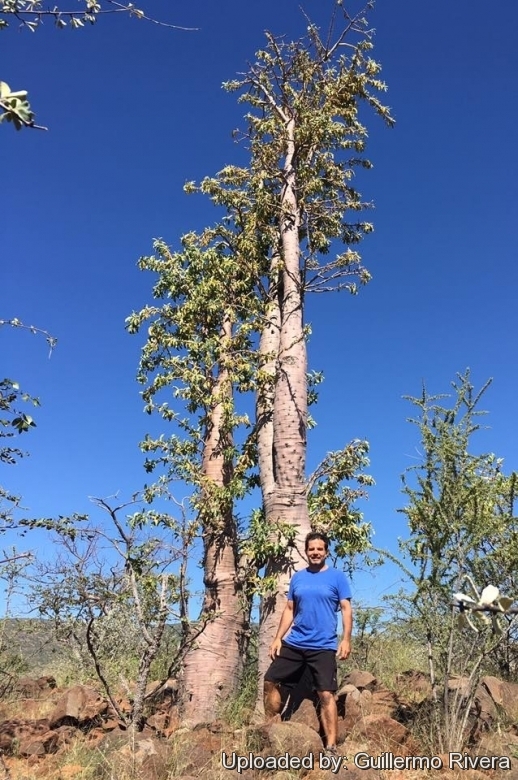 Derivation of specific name: The specific name honors the Portuguese cartographer Fernando da Costa Leal who described the Bottle tree during an exploration in southern Angola. Stems: Trunk soft, succulent, with a massively swollen cylindrical basal portion up to 40 (or more) cm in diameter, tapering narrowly upwards, often somewhat bottle-shaped sparingly branched from the middle, occasionally forking near the base. Bark tough silvery-grey to pale brown with darker transverse scars. Main stems few upright tuberculate sparingly branched towards the apex. Trunk and branches bears numerous rigid spines in clusters of three and are full of a watery, resinous and viscid watery latex (juice). As the plant matures, the lower trunk becomes very corky and woody in appearance. Young branchlets and spines glabrous dark grey, reddish brown or purplish. Stipular spines: In spreading pairs, arising from a small cushion with a central depression, slender, rigid, spreading, often a third intrastipular spine arising proximally, the two laterals 2.5-3(-4) cm long, those of the short shoots much shorter. Leaves: Few, soon deciduous, scattered in spirals along the branches or usually in fascicles only near ends young branchlets (abbreviated axillary shoots), sessile, obovate-oblong or oblong-lanceolate, 2.5-8(-10) cm long, 1.2-4 cm broad, membranous, dark glossy green, finely tomentose to almost glabrous above and below with a strong midrib, apex obtuse often terminating in a mucro ( long subulate acumen), base cuneate, secondary nerves usually visible in mature leaves. Margins slightly wavy. Inflorescences: Terminal, glabrous, in small sessile many-flowered clusters (cymes) up to 15–18 cm in diameter on minute lateral branchlets, produced in the spring, when trees are leafless. Pedicels stout, 2-3(-8) mm long. Bracts small, scale-like, triangular, acute, fringed with minute hairs, soon deciduous. 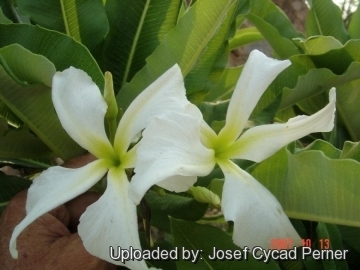 Flowers: Large, showy, sweet-scented, white flushed pink in the outside and on the tube, 2.5-4 cm long, showy. Calyx glabrous 3-4 mm long. Sepals ovate, acuminate with margins ciliate. Corolla limb salverform 5-8 cm in diameter, white inside, pink on the back, lobes broad, spreading, obliquely ovate, 1.5-2.5 cm long and 1.8-2 cm broad, smooth, with curly margins, the inner margin crisp. Tube purple, cylindric, more or less urceolate (widened at the middle), 36–42(-50) mm long, 2.5-3 mm in diameter for 1-2 cm, dilated abruptly to 7-8 mm in diameter at the point of insertion of the stamens and then gradually attenuate to 4 mm at the throat, hairy within below the stamens. Stamens 5, anthers linear-lanceolate, shortly sagittate, 9-11 mm long, united in a cone, subsessile. Disc cupular, slightly 5-lobed. Ovary of 2 free carpels. Style thin, stigma cylindrical with a basal rim. Blooming season: Pachypodium lealii flowers from May to November, with a peak in August in the middle of the dry winter, while Pachypodium saundersii tends to flower earlier in the year, from February through to May. Fruits: The fruit is a twin cylindrical follicle (two separate mericarps), spreading at a right angle when mature, spindle-shaped, attenuate at the apex, compressed, glabrous, pale to dark-brown with longitudinal lines or lenticellate outside, about 7-10(-12.5) cm long, 1 cm in diameter, that split down one side to shed numerous seeds. Seeds: 7-9(-10) mm long, narrowly ovoid to obovoid, compressed, with a coma (tuft of silvery silky hairs) at one end, 2–3 times as long. 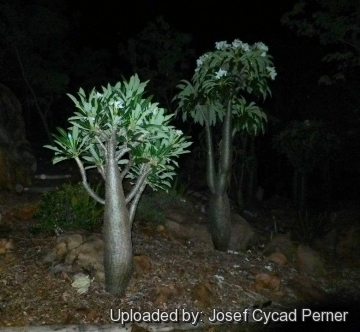 Pachypodium lealii subs. saundersii (N.E.Br.) G.D.Rowley: Shrubby to sprawling with a broad, bulbous base from which multiple trunks sprout. It produces terminal clusters of large white flowers tinged with purple. 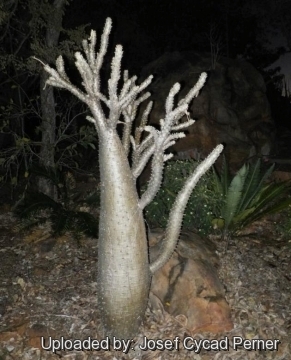 10) Board of Trustees of the Royal Botanic Gardens, Kew “Pachypodium lealii (bottle tree)” <http://www.kew.org/science-conservation/plants-fungi/pachypodium-lealii-bottle-tree> Web. 13 Sep. 2015. 11) Wikipedia contributors. "Pachypodium lealii." Wikipedia, The Free Encyclopedia. Wikipedia, The Free Encyclopedia, 6 Sep. 2015. Web. 13 Sep. 2015. 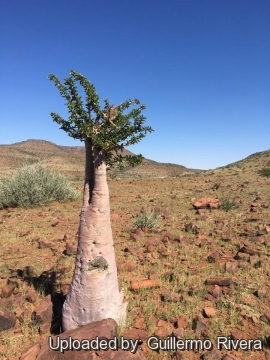 Cultivation and Propagation: The Bottle tree, Pachypodium lealii is reportedly the most difficult to cultivate of the continental African species of Pachypodium.. They seem to be rot-prone under less than ideal conditions and care. Water sparingly and give extra well-drained soil to avoid waterlogged conditions Give it moderate water during this growing period, and minimum to no water the rest of the time. Sun Exposure: Light shade to full sun. Hardiness: Will take some light frost, but rots easily in winter when cold and extended wet. 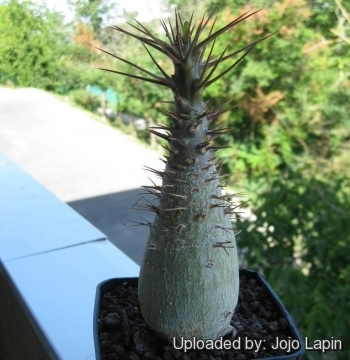 To make them less prone to rotting, they can be grafted onto Pachypodium gaeyi or Pachypodium lameirei. Plant grafted grow even faster and flower easily. Traditional uses: Traditional hunters have used the highly toxic sap of the bottle tree as an arrow poison, and have carved drinking bowls from the wood to poison unwitting birds. Propagation: Seeds or cutting: It grows easily from seeds as long as seeds are fresh, Seeds can be sown in the summer. After germination, care should be taken not to overwater as this encourages rot and fungal infestations. Keep plants well ventilated, in good light and dry plants out in the dormant season which is summer (March to Oct).With cuttings the success is not always guaranteed. Cuttings should be taken in the period just before the growing season starts and the wound is treated with a fungicide and then left to dry for at least two weeks. Cuttings are inserted in a well drained medium. Cuttings are kept in a hot well-lit and ventilated area and watered sparingly in the winter months; once a week should be more than enough. The trickier Pachypodiums such as P. lealiican be grafted onto the rootstock of a more robust species such as Pachypodium lamerei to avoid roots rotting off. 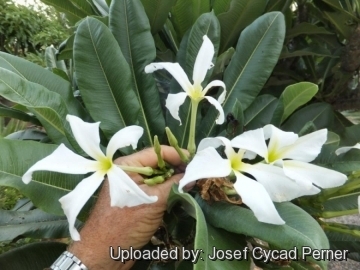 Known hazards: As with other members of the Apocynaceae family, the sap of this plant is extremely toxic. The sap can also cause blindness when in contact with the eyes.